All of us have seen those plastic game sets that usually debut in early Spring. I have purchased several of those sets for my boys over the past few years. A piece or two always breaks as soon as we start setting the games up and playing. After discovering Rollors, it is nice to know that there are still a few high-quality products available that can withstand the wear and tear of two young boys as well as outdoor elements. 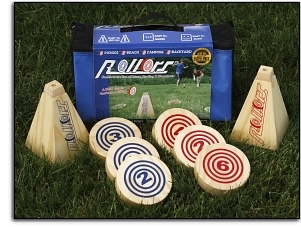 Rollors combines bowling, Bocce ball and horseshoes in a fun, non-technological game that is a blast for the entire family. There are several ways to play the game but the overall goal of the game is to roll the discs as close to the goals as possible to score the most points. By rolling the discs, you're incorporating bowling aspects. It is recommended to play Rollors in the grass or sand instead of a completely smooth area (i.e. parking lot, blacktop, etc.). 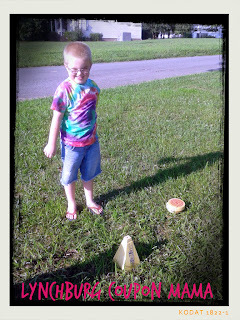 When playing Bocce ball, the goal is to get the balls to the right position to score maximum points. Aiming the discs to land as close to the goals as possible is similar in how you want horseshoes to land near or on the posts. We had so much fun playing the game as a family. It was a challenge for the kids and adults too! The most challenging part is mastering the bumps and grooves in the yard to keep the Rollors from rolling half-way across the yard in the opposite direction that you want it to go! The boys are usually occupied with a game for around 30 minutes to an hour but even after an hour and a half, my boys were begging for one more round to see how much they could beat us! And yes, they truly beat us at this game! Position the red and blue pyramid-shaped goals approximately 25 feet apart - this can be changed based on the ages and skills of the players. One person/team is red while the other is blue. The person/team stands opposite of his/her color of goal. So if I chose red, I would be standing behind the blue goal to roll my Rollors toward the red goal. The player/team with the blue discs starts the game! The disc is rolled and released similar to a bowling ball with the disc being on its edge. The disc must be released within 4 feet of the ground or less. Once the disc stops, it is a red player's turn and so on. 1. If a Rollor lands on its edge, the point value is the side that is showing. 2. If a Rollor stays up on edge, the point value is both sides of the disc added together. 3. If the Rollor lands up against the goal, the point value showing is doubled. All of these points are added together and added to previous rounds. A player/team wins when he/she reaches a score of 21; however, that player must be at least 2 points ahead of the other team. If he/she is not ahead by at least 2 points, another round is played to determine the winner. You can purchase the Rollors game for $39.99 here! 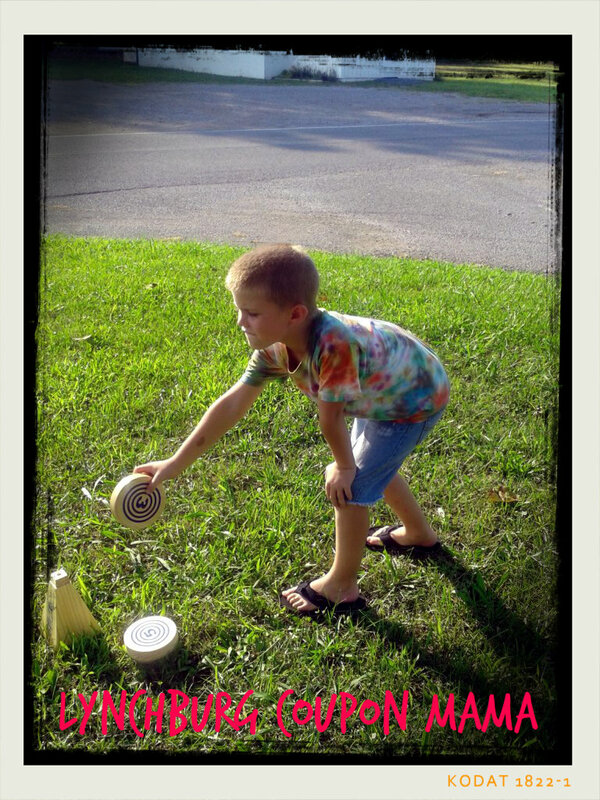 Enter below to win a set from Lynchburg Coupon Mama and Maranda Enterprises! You must be at least 18 years of age and a resident of the United States. The giveaway begins August 1st at 9:00 p.m. CST and ends August 15th at 9:00 p.m. CST. Good Luck!